In mining terms, the asteroid was a “lumpy,” or a rock rich in iron, cobalt, nickel, and other ferromagnetic minerals. Miners used scanners to look for concentrations of metal in the stone, which they called “lumps.” The more lumps or seams of metal they found, the higher the metal-to-stone ratio. No lumps meant the rock was a “slagger” or a “dumpy,” a worthless chunk of nothing. […] It was tedious, hard labor, but if the lump was big enough, it was well worth the effort. ‘Earth Unaware’ is the first of three novels that will form a prequel trilogy to ‘Ender’s Game’ which will tell the story of the First Formic War and introduce readers to a young Mazer Rackham. ‘Earth Unaware’ begins the trilogy with a family that travels through space mining asteroids for metals. While large families traveling through space self-sufficiently may be a hard concept to grasp, asteroid mining should not be. Asteroid mining may be the next booming industry. Last year a company called Planetary Resources announced their intent to mine local asteroids for metals, water, and other precious resources. This year, a similar company called Deep Space Industries announced a similar adventure. Both companies bring the idea of asteroid mining beyond fiction and into reality. While the free-mining families in ‘Earth Unaware’ sell their harvested metal for enough profit to sustain their health and travel, Planetary Resources and Deep Space Industries have different motives in mind. 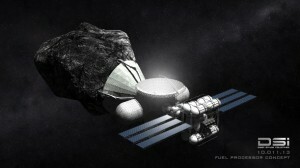 Both of their unmanned missions plan to create fuel stations in orbit for private spacecraft from the mined resources. Additionally, Planetary Resources intends to alter the trajectories of asteroids, and return whole asteroids into lunar orbit for mining, and Deep Space Industries wants to use 3D printers to make metal components in space. If these companies are successful in their adventures, asteroid mining may become the next gold rush. This draws another parallel to ‘Earth Unaware’ in that small clans and large companies compete in their mining efforts. With high-priced resources waiting to be harvested, asteroid mining may be the catalyst Earthlings need to begin our venture into space.